The past spring and summer have been a weird one. I’ve been away from blogging for quite a while, since I’ve also been away from work for a while… I have unfortunately been coping with some serious personal life stuff, and resulting burn-out symptoms since February. Luckily, there was also a lot of support from friends, family and the university, which means I am slowly coming back to my normal self now. Progress on the thesis has been slow, but I have been steadily looking at the inscriptions from my first case study, the polis Kos, which is now producing the first real results. In better news, I was also able to go on a field trip / vacation to the island Kos with my good friend Tamara! The beaches, views, food, and of course the spectacular archaeological sites were a welcome break. What impressed me the most, I think, were the phenomenal lay-out and surroundings of the Asklepieion. This is perhaps unsurprising, and doubtlessly also due to the (rigorous) reconstruction work done by the Italian excavators. Yet, a similar feeling struck me that I have also had in sites that have not been so thoroughly reconstructed . In the Apollo sanctuary at Delphi (although equally well-excavated), for instance, I have always found it immediately apparent why the Greeks chose it as the site for one of their most central sanctuaries. The multiple visits that we made to the site of the Asklepieion, too, clarified how the place must have come across to the Hellenistic Greeks. The lush cypress grove through which the road leads one from the city to the sanctuary, the ascension through the three terraces and the magnificent view on top, all of it framed by the impressive monumental architecture, put together in a single building project, everything contributes to the site’s grandeur and sacral feeling. Now imagine not just the monumental architecture, but also numerous honorific and dedicatory statues, as well as countless inscribed stelai with texts issued by the community – not just to regulate the cult(s), but also to celebrate and perpetuate their connection to other states. The experience made it even more apparent to me how important the environments in which texts were displayed are for the impact that they had on the visiting public. The view from the top of the Asklepieion downwards. An exquisite specimen: Aptera honours a doctor from Kos, mid-second century BCE. 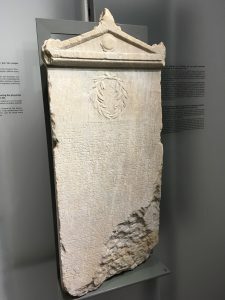 A number of the texts concerning the Koan asylia, as well as some other notable inscriptions, are quite well-exhibited in a tiny museum on-site. Unfortunately, we had arrived just after a rather disastrous earthquake centered near Bodrum which, besides doing catastrophic damage to the Koan harbour and numerous buildings (old and new) in the centre, also closed quite a few of the archaeological exhibits. 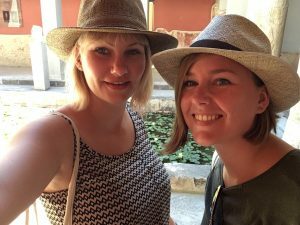 Due to this, we were unable to visit the exhibits in the Kastro, as well as on the top floor of the archaeological museum in the city. We did, however, get a private tour of the fascinating excavation at Kardamaina (ancient Halasarna) by one of the excavators himself, Dr. Nikolas Dimakis. Coffee and later drinks with other colleagues ensued which, besides some useful references and background, provided for a very pleasant pastime. The rest of our days were passed with the numerous other sites, especially around Kos town (the Casa Romana, a museum set up along the foundations of the Roman house beneath it, stood out especially); an adventurous road trip to seek out the elusive White Cave (as the road turned rougher and rougher, we turned around before managing to find it); swimming, promenading and many pleasant dinners, lunches and even a few cocktails. Filled with new experiences, cultural enlightenment and the spirit of antiquity, we have returned home to diligently apply ourselves to our dissertations once more.